Suspected members of the MS-13 gang are escorted to their arraignment in Mineola, New York, Jan. 11, 2018. Leaders of the Central American street gang MS-13 have a new problem on their hands: their U.S.-based members are not violent enough. The gang, with about 10,000 members in the United States, is notorious for its propensity for vicious violence. Initiation requires committing murder. And many gang members have been convicted of homicides, some using machetes to behead their victims. But with the administration of President Donald Trump vowing to stamp out MS-13 and other criminal organizataions, the gang's El Salvador-based leaders have seen hundreds of members put behind bars in the United States and even larger numbers arrested and charged in El Salvador. Now, they're looking to beef up the gang's U.S. ranks by sending younger, more violent members to the United States, law enforcement officials said. 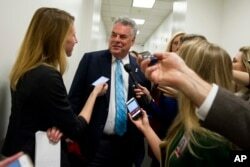 Rep. Peter King, R-N.Y. speaks with reporters on Capitol Hill in Washington after a House Republican leadership meeting, Nov. 15, 2016. Stephen Richardson, assistant director of the FBI's criminal investigative division, said the mass arrests and imprisonment of MS-13 members and mid-level leaders over the past year have frustrated MS-13 leaders. "They're very much interested in sending younger, more violent offenders up through their channels into this country in order to be enforcers for the gang," Richardson told the House Committee on Homeland Security on Thursday. MS-13 leaders operate mostly out of prisons in El Salvador, directing members in the United States to engage in extortion, drug and gun trafficking, and other criminal activities. The gang has about 40,000 members worldwide, according to the Justice Department. Peter King, the committee's Republican chairman, said his staffers had recently traveled to El Salvador and were informed by law agencies there that the gang's leaders were "frustrated that MS-13 members in this country are not violent enough" and wanted to send "more violent members" to the United States. Richardson, citing FBI intelligence, confirmed the report. "It's a horrifying thought," King said. Last year, the Justice Department indicted 17 MS-13 members, charging them with a dozen killings and other violent crimes committed on Long Island, King's congressional district. Raymond Villaneuva, an assistant director for U.S. Immigration and Customs Enforcement, told lawmakers that his agency was examining reports of MS-13 sending more violent members to the United States. "We're looking at the information we're getting and doubling down our efforts against MS-13," Villaneuva told members of the panel. The officials made the comments Thursday during a hearing on combatting transnational criminal organizations through information sharing. President Trump, blaming the gang's flourishing under his predecessor's lenient immigration policies, has made eradicating MS-13 a law enforcement priority for his administration. Last February, he signed an executive order directing all federal law enforcement agencies to take on gangs, transnational criminal organizations and cartels. In July, he traveled to Long Island to tell law enforcement officers that it was the policy of his administration "to dismantle, decimate and eradicate MS-13." FILE - U.S. Attorney General Jeff Sessions speaks during a news conference at the Department of Justice in Washington, Dec. 15, 2017. 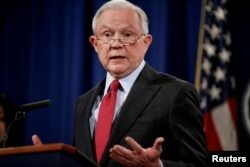 In October, Attorney General Jeff Sessions designated the gang as a priority for the Justice Department's Organized Crime Drug Enforcement Task Forces (OCDETF). The designation allows the OCDETF, a group of prosecutors and investigators drawn from various federal agencies, to use drug laws, gun laws, tax laws and racketeering laws to investigate and prosecute MS-13 gang members. In September, U.S. officials, along with those from the three Central American countries, announced they had charged more than 3,800 members of the MS-13 and 18th Street gangs in coordinated law enforcement action since March. Sessions said last month that the Justice Department had secured the convictions of more than 1,000 gang members in 2017.